This is a skilfully constructed book in both its images & language. A building site full of diggers, cranes & bulldozers which ends in a row of newly built houses & families moving in. Both Bryn and I love the 3D torn paper collages in this book. Bryn enjoyed spotting what the pictures were made up of and it inspired him too root through the paper recycling & create his own pictures. Bryn was also fascinated with the array of construction vehicles in the book. Each double page spread is action packed as each vehicle contributes its own unique aspect to the building project. 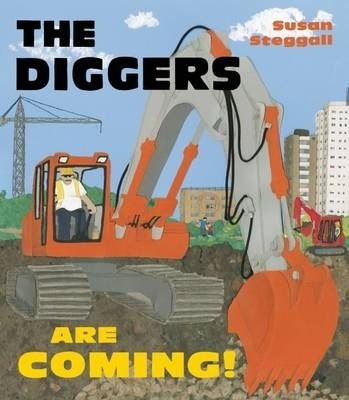 A real treat of a book to read aloud with its rhyming and alliteration, this has been a big hit. This entry was posted in Uncategorized and tagged bryn, Guardian on May 21, 2013 by damyanti.